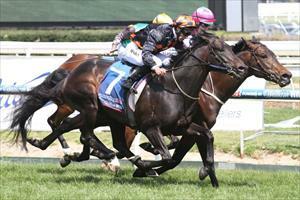 Trainer Danny O’Brien is already targeting a third Group 1 Australian Guineas (1600m) victory in five years. Having won the race with Shamrocker (2011) and Shamus Award (2014), O’Brien is aiming AAMI Victoria Derby (2500m) runner-up Bondeiger towards next year’s renewal. O’Brien said the Guineas would be the son of War Pass’ first goal before a potential trip to Sydney for races such as the Rosehill Guineas (2000m) and ATC Australian Derby (2500m). “He’ll be second-up into the Australian Guineas, which is a formula which worked with both Shamrocker and Shamus Award, then we’d potentially go to Sydney from there,” O’Brien told RSN’s Racing Ahead. “Shamrocker had a similar Spring to him, she ran second in the Oaks, and came back and made huge improvement winning both the Australian Guineas and the (ATC) Australian Derby (2400m) and I wouldn’t say those races are out of reach for him. In related news, O’Brien said Prompt Return had pulled up well following his victory in Saturday’s Group 3 Maribyrnong Trial (1000m) at Flemington and was on track for the $200,000 Magic Millions Clockwise Classic (1000m) at Ballarat.